Status and trends: The most recent survey in May 2015 estimated 12,297 ± 934 (SE) which is an increase from the 2013 estimate of 7,287 ± 530 (SE) (Campbell and Boulanger 2016). Since the re-introduction in 1968, abundance increased to a peak of 30,381 (± 3,982 SE) in 1997. By 2003, caribou were declining which continued until 2013. The exponential rate of increase 1978 to 1997 is 0.17 (a doubling time of 5.5 years) and the decline is -0.05 (a halving time of 14 years). 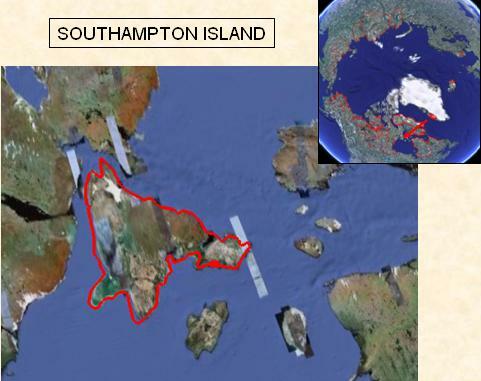 Ecology: Southampton is a large and predator-free island (43,000 km2) usually isolated from the nearby mainland as currents and tides prevent ice-crossings. Caribou had died out by 1957 and were re-introduced with 48 caribou from nearby Coats Island (5,498 km2) in 1968 (Ouellet et al. 1996). Based on micro-satellite DNA analysis, the caribou are genetically distinct from mainland barren-ground caribou with lower genetic variation (McFarlane et al. 2016). The relatively rapid numerical increase may be why the reduced diversity via genetic drift is below the detectable levels by bottleneck tests (McFarlane et al. 2016). An unusual aspect of the ecology is a high prevalence outbreak of the bacterial disease Brucella suis. Brucellosis was not known on Southampton until a low prevalence was detected in 2000 during commercial harvests and subsequently, prevalence increased to 59% in 2011 (Campbell 2013). Southampton has one Inuit community (Coral Harbour) which has, in 2011, 834 people. Inuit from the mainland occasionally hunt on northern Southampton Island. The subsistence harvest started in 1978 and by 2001, the estimated annual subsistence harvest was 2000 caribou. Climate: The climate is modified by the surrounding Hudson Bay and severe winters are relatively frequent with freezing rain and higher snow fall in the autumn (CARMA unpubl.). Monitoring: Monitoring trend in caribou numbers is through stratified strip transect aerial surveys with a relatively high average survey frequency of 2.3 years. Monitoring vital rates is largely based on sampling caribou for fat indicators, diet, pregnancy, age, diseases and parasites during commercial harvesting (1994-2009). Pregnancy rates were high (70-90%) from 1988 to 2001 but declined and became annually variable as brucellosis prevalence increased (Campbell and Boulanger 2016). The exceptionally low pregnancy rates 35-40% in 2005, 2008, and 2011 were likely also the result of winters with fall freezing rain and icing (Campbell 2006, 2013). Management: The mechanism for the decline was likely an interaction between disease, climate and harvesting. The herd’s annual range is within the jurisdiction of the Nunavut Wildlife Management Board, and the Government of Nunavut. Management concerns were initially about the implications of a rapidly increasing re-introduced herd and commercial harvesting started in 1993 to manage the abundance and also for local benefits (Nunavut Coral Harbour HTO & GN 2013). The annual commercial quota increased from 1,000 caribou in 1993, 5,000 in 1994 and 6,000 by 1997 although the annual harvests averaged 2682 ± 243 (SE) (Coral Harbour HTO & GN 2013). In 2008, the Government of Nunavut and the Coral Harbour Hunter’s and Trapper’s Organization recommended cancelling commercial harvesting because of fears about brucellosis and declining numbers. Concern about the decline 1997-2011, is summarized in a management plan (Coral Harbour HTO & GN 2013) and in public hearings for a Total Allowable Harvest (https://www.nwmb.com/en/public-hearings-a-meetings). In response to the decline, the hunters by the 2012, recommended establishing a Total Allowable Harvest of 1,000 caribou to manage an increasing inter-settlement trade involving private sales to people suffering from the shortage of caribou on Baffin Island. Most recently, the 2015 estimate of an increase in abundance may reflect reduced incidence of brucellosis, high productivity in 2014 and 2015 as well as immigration from the mainland based on reports of tracks on the sea ice in winter 2013-2014 (Campbell and Boulanger 2016). Campbell, M. 2006. Monitoring condition, feeding habits and demographic parameters of island bound barren-ground caribou (Rangifer tarandus groenlandicus), Southampton Island, Nunavut. Final Status Report No. 3. Department of Environment, Government of Nunavut. 18 pp. Campbell, M. 2013. Population Estimate of a Declining Population of Island Bound Barren-ground Caribou (Rangifer tarandus groenlandicus), Southampton Island NU.Unpublished Interim report, downloaded http://www.nwmb.com/en/public-hearings-a-meetings/public-hearings-1/2014/public-hearing-concerning-the-government-of-nunavuts-proposal-to-lower-the-total-allowable-harvest-of-southampton-island-caribou-from-1000-to-800-caribou-and-to-consider-non-quota-limitations/proposal-for-nwmb-decision-and-supporting-evidence. McFarlane, K., A. Gunn, M. Campbell, M. Dumond, J. Adamczewski and. G. A. Wilson. 2016. Genetic diversity, structure and gene flow of migratory barren-ground caribou (Rangifer tarandus groenlandicus) in Canada. Rangifer, 36:1-24. Ouellet, J.-P., Heard, D.C. and Mulders, R. 1996. Population ecology of caribou populations without predators: Southampton and Coats Island herds. Rangifer Spec. Issue. No. 9. 17-25.